As a city that prides itself on tolerance, diversity and progressiveness, Brighton has one of the most thriving gay scenes in not just the country, but throughout Europe. Over the years, gay pubs and bars have taken root and sprung up around the city. There’s plenty to choose from for a great night out, but here’s our guide of some of the best taste-makers trending now in the UK’s unofficial gay capital. One of the most legendary gay bars and clubs in Brighton, Legends’ population often booms in the moments before the sunrise. The sea-gazing terrace, close to both Palace Pier and Kemptown, is rather sedate during the day, but at night it undergoes a metamorphosis and the Legends Bar and The Basement Club heave with revellers from around the city, as well as visitors staying in the contemporary Legends Hotel. There are regular club nights with big deal DJs as well as excellent cabaret, the perfect excuse to frequent when seaside. It’s the new thing on St James’s Street, the main thoroughfare of Kemptown and it’s shaking up the established hierarchy of cabaret in the neighbourhood. Harkening back to tradition with mimed drag acts, there’s also karaoke contests for the brave and Thursday nights hosted by Big Brother local boy Pete Bennett. It’s early days, but judging by the crush at the doors for their old school drag vibe, Priscilla’s is definitely on to something sweet. Slightly off the well-beaten paths of Kemptown is the Camelford Arms, a pub that boasts a spirit of inclusion and affability that extends to canine pals, making it known as the most dog-friendly pub in town. The Golden Handbag award winner (G-Scene) for ‘Best Sunday Lunch’, the menu is pages upon pages of pub grub and greasy spoon fare. A slightly more chilled and leisurely pub experience, best enjoyed after a hard night on the tiles at The Basement Club or Envy. Born the notorious inn, the Golden Cross in 1787, The Marlborough’s history as a meeting house for activists and artists is as rich as it is progressive. With such a long life, it’s no wonder that it’s rumoured to be haunted and features on Brighton’s famed Ghost Walk. But this latest century has seen a renewed focus on gay activism, starting with the Sussex Gay Liberation Front out of the University of Sussex in the ‘70s. It’s small but perfectly formed performance space has premiered work from Aputheatre and Siren Theatre Company and enjoys a lively programme of events throughout the year. 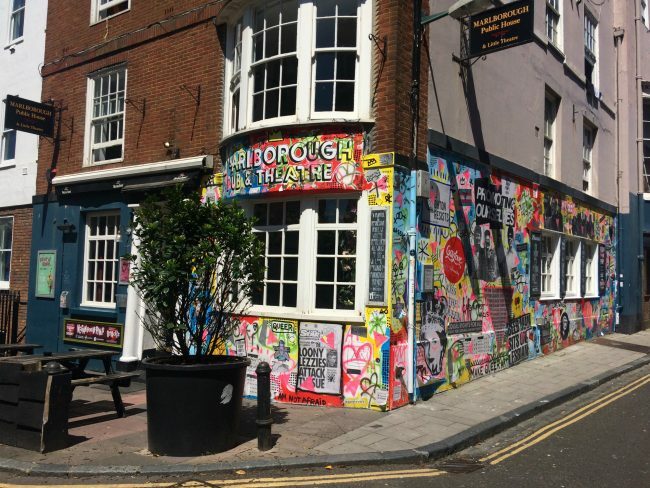 The starting point for the first ever Trans* Pride march in 2014, The Marlborough today is a popular student haunt with a stellar quiz on Thursdays – the jewel in the crown of Brighton’s queer and non-binary scene. With entertainers named Kara Van Park and Victoria Sponge, you know you’re in for a good night. There’s cabaret at this Kemptown pub six days a week – over 300 performances each year – by the some of the city’s best drag queens. It’s a favourite with locals and visiting hen dos – just look for the trademark bubble gum pink exterior. The friendly staff and inclusive atmosphere make it a must visit when in town to get an authentic cabaret experience. Another new addition to the Kemptown scene, Bar Broadway is pulling crowds from the LGBTQ community as well as straight am-dram lovers. There’s the usual weekly cabaret, karaoke and live performances (even Chico, erstwhile X Factor favourite, has been by) but what really makes BB unique is the app, where you can buy tickets to shows, plays and best of all, request the musical clip you want – from Glee to Cats – to be shown on the bar’s TVs for a good old sing song with your new best pals. You might be there all night. Another seafront bar just moments away from Legends, The Amsterdam Bar & Kitchen offers everything needed for a stay by the sea. The food and drink here are as considered as at Camelford, including a new gin menu (featuring homegrown Brighton Gin). There are quizzes, karaoke and cabaret, and on the first Saturday of the month, it’s the meeting place of the Brighton Deaf LGBT group. From the terrace, there are fantastic views over the promenade to the setting sun, the perfect place to get any evening’s festivities started. A lovely evening at The Amsterdam!